People using the Web are constantly invited to share their opinions and preferences with the rest of the world, which has led to an explosion of opinionated blogs, reviews of products and services, and comments on virtually everything. This type of web-based content is increasingly recognized as a source of data that has added value for multiple application domains. While the large number of available reviews almost ensures that all relevant parts of the entity under review are properly covered, manually reading each and every review is not feasible. 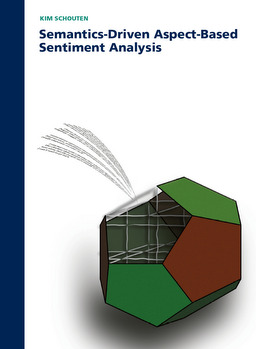 Aspect-based sentiment analysis aims to solve this issue, as it is concerned with the development of algorithms that can automatically extract fine-grained sentiment information from a set of reviews, computing a separate sentiment value for the various aspects of the product or service being reviewed. This dissertation focuses on which discriminants are useful when performing aspect-based sentiment analysis. What signals for sentiment can be extracted from the text itself and what is the effect of using extra-textual discriminants? We find that using semantic lexicons or ontologies, can greatly improve the quality of aspect-based sentiment analysis, especially with limited training data. Additionally, due to semantics driving the analysis, the algorithm is less of a black box and results are easier to explain.